“Technology is changing everything, and teaching should be no different. But what stays the same is the learning process: reflection, discussion, and problem solving,” said keynote speaker Candace Thille, director of Carnegie Mellon’s Open Learning Initiative. To strengthen the faculty’s interest in next-generation technologies, SJSU hosted the “21st Century Teaching: Opportunities and Incentives” symposium Sept. 24 at King Library. The one-day workshop focused on using online educational resources to enhance student learning. 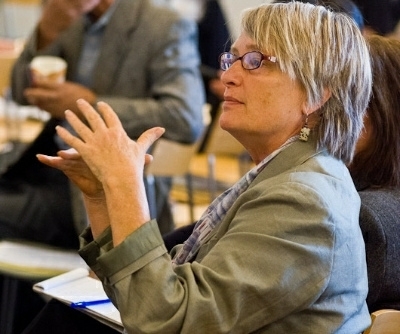 More than 150 faculty members attended, building on SJSU’s Next Generation Technology Initiative. “It is so exciting that faculty members want to learn something new to help our students and leverage technology we have here in Silicon Valley,” said Provost and Vice President for Academic Affairs Ellen Junn. 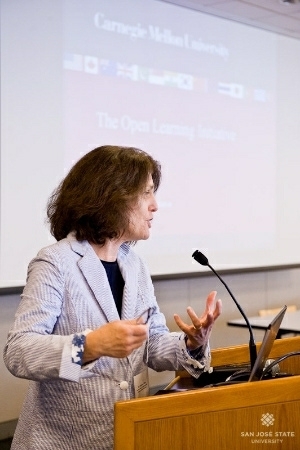 Keynote speaker Candace Thille, professor and director of the Open Learning Initiative at Carnegie Mellon University, discussed developing better tools for teaching today’s student within an open-source learning environment. “There is a great diversity in how well prepared students are and what skills they have to engage [in university life] once they get here,” Thille said. She also discussed developing goal-directed practices, building fluency in open-source learning environments, and using interactive student data to guide teaching. After Thille’s address, SJSU faculty members from the colleges of engineering, education, business and social sciences presented existing online education initiatives and the results of these experiences. Over lunch, faculty members discussed and joined various technology-related Faculty Learning Communities to explore the new teaching landscape with colleagues. Topics include Affordable Learning Solutions, Big Data, lecture capture/video conferencing, and learning and games. You can view the full symposium here.